Join us for a fun-filled weekend with this family friendly event! 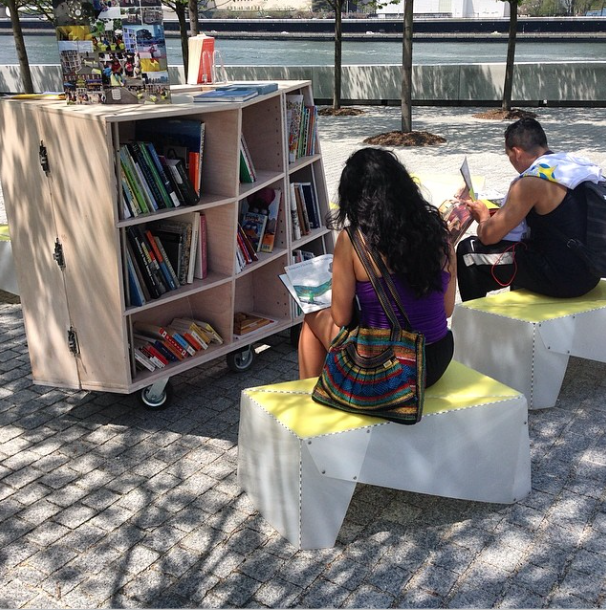 At the Uni Project, our pop-up reading room, come sit outside, read, draw, enjoy the view, and explore a curated collection of books and hands-on materials. Story Time will take place at 12:30pm and again at 2:00pm. The Roosevelt Island branch of The New York Public Library is a growing facility. Located on 524 Main Street, the branch is set to move down the street in 2018 to better serve the community. It all began in 1976, when Dorothy and Herman Reade of Forest Hills, Queens, retired to Roosevelt Island and made it their goal to create a community library. The one-room Roosevelt Island Community Library, run solely by volunteers, served residents for 20 years. In 1997, Roosevelt Island Library became the 85th branch of The New York Public Library, and patrons have access to the full contents of NYPL’s network. Since then, the branch has attracted an ever-growing, diverse and community of users who enjoy a wide range of materials, programs, and services — including weekly Toddler Story Time and Baby Story Time programs, computer classes, and our Thursday morning Knitting and Crochet Group. The branch's Book Discussion Group meets on the third Thursday of each month.